Brown and grey bricks, topped with silver cones meet your eyes, standing almost sternly amongst the bright green grass. As you step closer to the looming castle, its serious façade may remind you of an austere lord. Then you enter and find yourself surrounded by luxurious, sophisticated furniture, paintings and decorations that are sumptuous enough to make the most frivolous spender blush! Welcome to the Castell Coch and feel like royalty as you explore it’s many chambers. What started out as a chieftain’s stronghold became architect William Burges’ creation for the 3rd Marquess of Bute. The Marquess desired a rural retreat that would complement the beauty of his castle and Burges complied with this Gothic masterpiece. It is situated on a hillside near the village of Tongwynlais, in the north of Cardiff. With its medieval appearance and working drawbridge, it impressively imitates a building style far older than the time it was created. Its interiors are dazzlingly styled in the High Victorian manner, thus creating a stunning contrast that impresses all who see it. This small castle looks like it belongs in a fairytale and you’ll definitely feel like you’re in one upon entering. Touring the castle is a favourite activity for both people who’re new to the city as well as newcomers. You’re provided a machine that gives commentary as you explore each room and tell you the stories behind each aspect. The castle has been used to film numerous movies and TV shows, most notably Doctor Who, The Scarlet Pimpernel and Robin Hood. Famous chef Heston Blumenthal used the castle in his cooking show ‘Heston’s Great British Food’. Try to see if you can spot the locations used on air by foot! The castle’s rooms are equipped with multi-sensory displays with touch screen technology, ensuring easiness of exploring and understand the different areas. Each room comes with an interesting history to it, so don’t miss out on all the physical details that compliment them. Closes at 04.30 pm in the winter. Tips and Warnings: Under 16s must be accompanied by an adult. Please note that the tearoom will be closed until further notice. Road - M4 (Jct. 32), A470 then signposted. Rail - 2.5km/1.5mls Taffs Well, Cardiff-Taffs Well/Merthyr, Tydfil/Aberdare/Treherbert route. Bus - 1km/0.6mls Tongwynlais, route No 26, Cardiff-Tongwynlais /Tredegar or route No 132 Cardiff-Tongwynlais-Mardy. 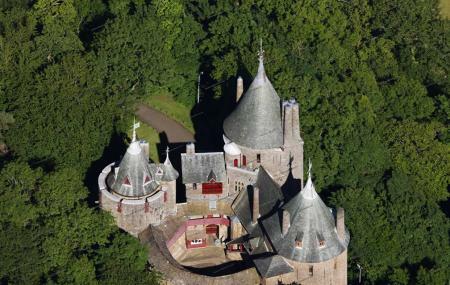 How popular is Castell Coch? People normally club together St. Fagans - National History Museum and Bute Park while planning their visit to Castell Coch. Stunning fairy tale castle built by a Scottish laird on the ruins of a Welsh castle at the end of the nineteenth century and decorated by an Englishman. Still, this joint effort produced one of the prettiest castles anywhere, well worth a visit. Great afternoon out ... Fascinating place! Brilliant staff enhanced our visit with in-depth knowledge across the board ... Highly recommend. Thank you Castell Coch! Outstanding place. Full of history and real interesting. Some nice walks to be had around the area to. Excellent visit so unusual. Nice café too. Didn't go into the grounds but looks like good walking.